Cottage cheese has lots of benefits. It is a good source of protein and calcium and is of great benefit to vegetarians. If you do not like to consume cottage cheese, you are sure to like it after reading about its benefits. Potassium is found in high amounts in cottage cheese. This mineral has lots of benefits to offer your body. If you are suffering from muscle cramps during menstruation or if you are under immense work pressure and fear that you may suffer from a brain stroke or nervous breakdown in near future, all you have to do to get relief is to include cottage cheese in your daily diet. Potassium acts as a healer. It is great for getting you relief from anxiety. Potassium helps in regulating the blood pressure and keeps the functioning of your brain intact. It also prevents heartburns, thereby reducing chances of a stroke. So, whether you are feeling stressed or you want to avoid foods causing heartburn, cottage cheese is the remedy for you. Cottage cheese is a storehouse of selenium, which is an antioxidant with lots of benefits. It is good for lowering the risk of prostate and colon cancer, protecting the DNA from any damage and so on. It is beneficial for people of all age groups. Make sure that you consume only 50 mcg to 70 mcg of selenium per day. Do not have more than that. So, when you consume cottage cheese, keep this in mind. Cottage cheese is good for your heat too. Consuming cottage cheese daily in moderate amounts can help in preventing g heart attacks in future. It is also good for diabetic patients as it keeps the blood sugar levels within normal range. This is because of the presence of magnesium in cottage cheese. It is also beneficial for the maintenance of the nerves, the muscles and immunity. The enzyme secreted by the body because of the presence of magnesium is good for curing migraine, digestion as well as constipation. Magnesium is also good for treating psychological disorders in the early stages. So, having cottage cheese can enhance your mood as well. Make sure to include cottage cheese in your daily diet if you are expecting. It is full of protein, calcium and phosphorous needed for the mother and the baby. Eating something during the time you are pregnant can be tricky. You feel nauseated by the smell of some foods. Cottage cheese is mild and it has no strong smell. So, consuming it cannot trigger nausea. Many pregnant women detest drinking milk as it can make them want to throw up. Some find it hard to digest milk. Cottage cheese is a good substitute for such women. It will provide them the calcium required as well as the protein. You can cook yummy recipes with cottage cheese and have them. Of you feel lazy to cook then you can add cottage cheese to a salad or make a veggie dip. If you are planning to avoid consuming meat but worried about your daily quota of protein, then cottage cheese is the best option for you. It is a rich source of protein and can supply you with the protein needed. So, include cottage cheese in your daily diet to meet the energy requirements of your body. Cow’s milk contains the highest percentage of casein protein than almond milk or soy milk. As cottage cheese is churned out from cow’s milk, you get the highest amount of natural protein by consuming it. So, don’t get worried if you do not have a hearty breakfast of ham and bacon. Have cottage cheese instead and get the protein you require. Cottage cheese is loaded with various B-complex vitamins. These are great for the development of brain, metabolism and for reducing the cholesterol levels. Vitamin B12 in cottage cheese is wonderful for enabling the body to absorb iron and for keeping your faculty sharp. Riboflavin helps in converting carbohydrates into energy. So, if you prepare cottage cheese curry in Indian style with spinach and have it with rice, you can consume it without any fear of gaining weight. The carbohydrates you have consumed will be converted to energy by cottage cheese. Niacin in cottage cheese is good for treating indigestion. It also lowers the levels of cholesterol in the blood. Nowadays many women are suffering from breast cancer all over the world. The danger of breast cancer is bigger for those who are in their premenopausal stage. Cottage cheese is said to help in preventing breast cancer risk as it is rich in calcium and Vitamin D. So, remember to include it in your daily diet. 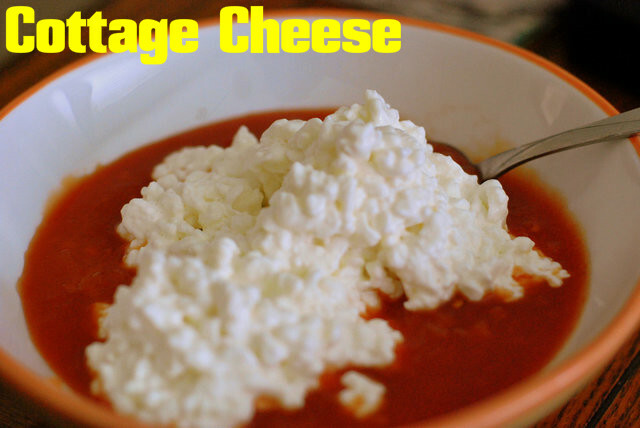 You can make different dishes with cottage cheese and have it. Cottage cheese is low in calories. By including 100 grams of cottage cheese in your daily diet, you will get only 98 calories. It is also tasty if you know how to prepare it the right way. Cottage cheese is rich in protein and is perfect when it comes to cooking up a healthy breakfast. If you prefer to have juice or smoothies, then you can add cottage cheese to your favourite fruits and make a smoothie that is creamy. This will keep you full of energy throughout the day. You can also stir-fry cottage cheese with some vegetables and have it as a sandwich in the morning. Instead of using butter, you can spread cottage cheese on your whole wheat toasts and have it. Make yummy desserts with cottage cheese and this will help you to keep a check on your body weight. If you have suffered from high cholesterol in the past, make sure that the cottage cheese you consume is made from skimmed or no-fat milk. Every dietary product, including cottage cheese, contains sodium. As you know, excessive sodium is not good for your health. If the cheese is made from unpasteurized milk, you may face listeriosis.